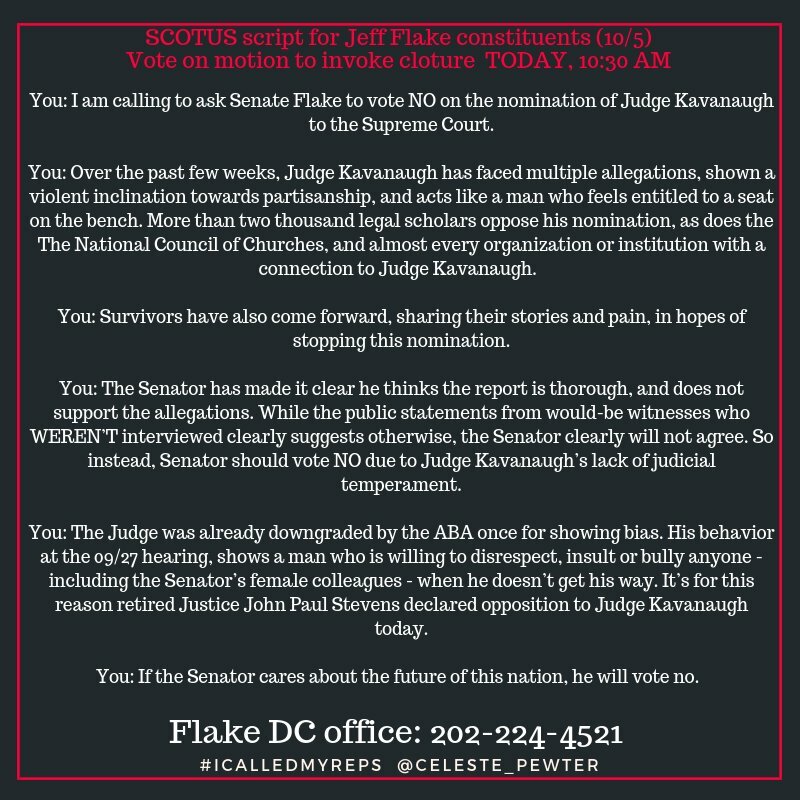 Update from Sarah Jane, Oct 6: The Senate invoked cloture early yesterday. 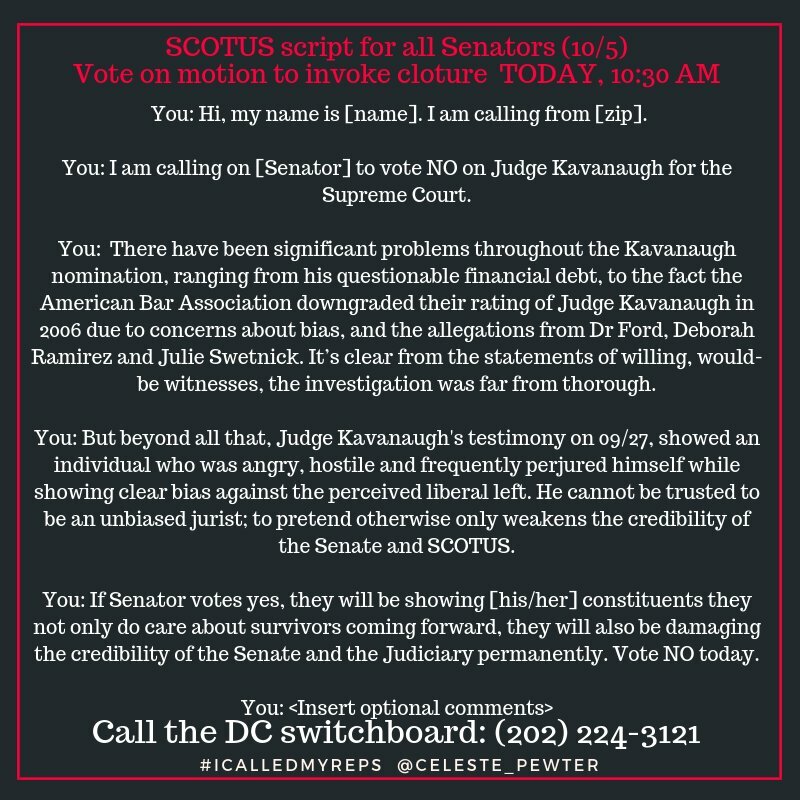 The move closed debate on Kavanaugh’s nomination and started a 30-hour clock leading to the final floor vote. 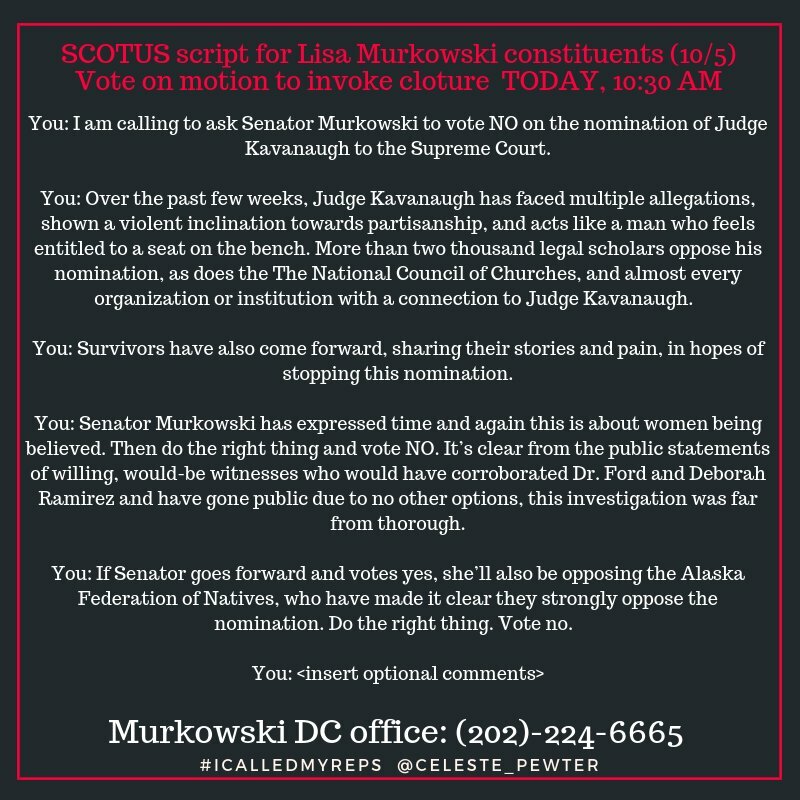 Lisa Murkowski delivered a surprise when she voted no on cloture, which also signaled her intention to vote no on the nomination. 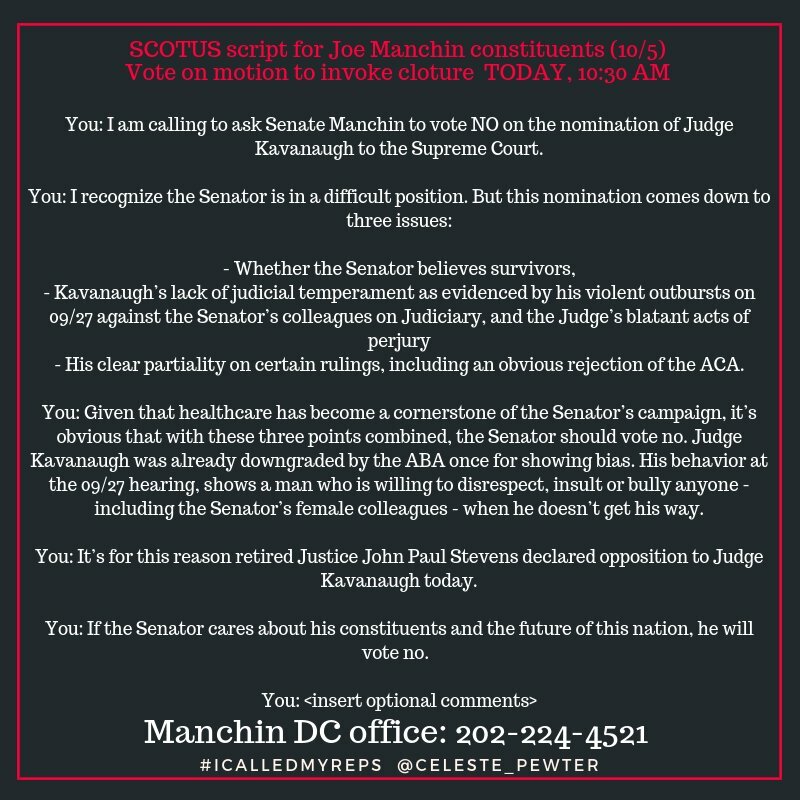 Unfortunately, the other three Senators who had been undecided–Jeff Flake, Joe Manchin, and Susan Collins–voted for cloture and stated they would vote yes. I won’t rehash their rationales. 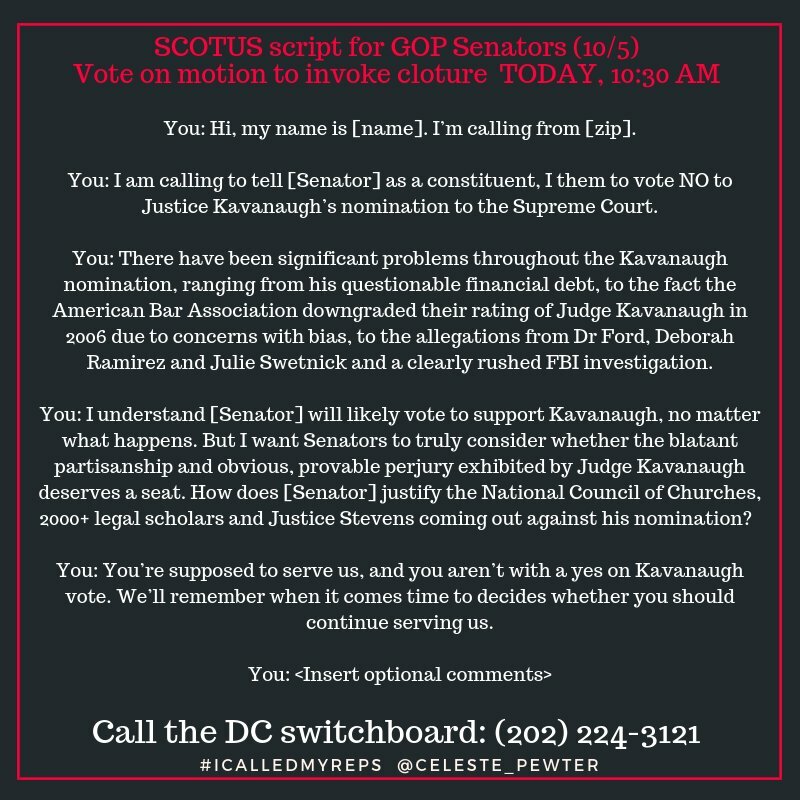 I will only remind you that today is the last day to call and oppose Kavanaugh. Yes, you can still do that, provided the vote hasn’t been held when you read this. The Senators can change their minds right up until they formally enter their choices. Odds are too many of them will do the wrong thing. You can still thank those who will do the right thing and make it difficult (politely! Always politely!) for those who will do the wrong thing. 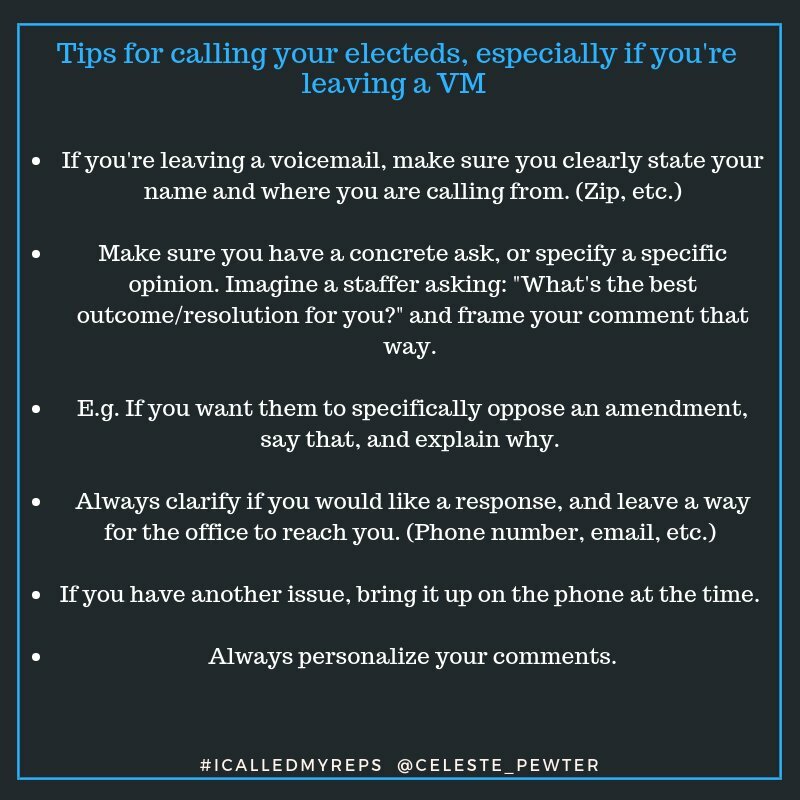 Scroll down for calling scripts, which come courtesy of Celeste Pewter (@Celeste_Pewter). If you can’t attend, watch and boost the #NoJusticeNoSeat hashtag. Continue to check the feeds of Celeste Pewter (@Celeste_Pewter) and Ben Wikler (@BenWikler) for news on the vote and on protests, respectively. Taking some time away is perfectly legit. This Kavanaugh madness has been long and tiring. If you need my dispensation to get extra rest, you have it. Just please come back. You’ve got to stay here and carry on the fight. Then get to work. Choose two Democrats per chamber, one incumbent and one challenger for each. 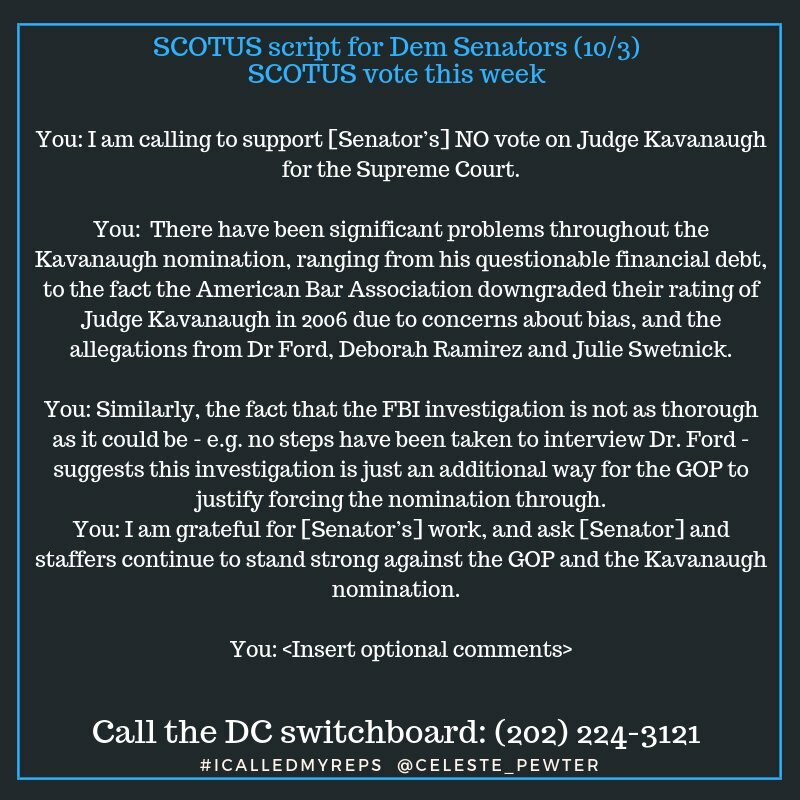 Work to make sure Democrats take the House of Representatives and do what you can to help Democrats win control of the Senate (this is a longer shot but it’s not impossible). The Senate is the tougher get. The map favors Republicans. If the Democrats hold all their Senate seats and gain two, they’ll win control. The Road to 2018 showcases incumbent Senate Democrats (and one Independent, Angus King of Maine) who are perceived as vulnerable. The Road to 2018 is one of Celeste Pewter’s projects. She encourages you to adopt a Senator by supporting him or her however you can–donating, phone-banking, canvassing, spreading the word. The most endangered among those shown on the page include Heidi Heitkamp of North Dakota, who bravely came out against Kavanaugh the day before the cloture vote; Bill Nelson of Florida, who is in a tough battle with Republican Governor Rick Scott for the seat; and Claire McCaskill of Missouri. Once you settle on a few candidates to boost, go to ActBlue and donate, then visit their websites and see what other sorts of help they need. Here are links to several past OTYCD stories on Democratic candidates for the House of Representatives. Most are challengers. This is far from a comprehensive list, and probably doesn’t include everyone we’ve written about who advanced to the general; this is just to give you ideas. Same again here as with the Senators. Once you’ve made your picks, donate through ActBlue and contact their campaigns to see how you can help. If you’re a regular OTYCD reader, it’s unlikely that Postcards to Voters is new to you. But! Tony the Democrat says that they’d need to recruit a few thousand more writers before they could consider assisting Heidi Heitkamp in North Dakota. This is not to imply Tony has a Heitkamp campaign lined up, or even under discussion; he simply said the postcarder army would have to add many more recruits before they could give her the help she’d need to get out the vote across the entire state. So! How about recruiting new writers to the Postcards to Voters cause? Here’s the FAQ page for Postcards to Voters. Get fluent in these answers, and start convincing others to sign on. Now, the calling scripts from Celeste Pewter (@Celeste_Pewter). Scroll past them to learn how to show your appreciation for her outstanding work.